www.nakedwines.com Limited, registered in England. Company registration number 06672317. Trading address and address for all correspondence; Norvic House, 29-33 Chapel Field Road, Norwich, NR2 1RP. Registered address; The Belfry, Colonial Way, Watford, WD24 4WH. *Next day delivery applies Monday to Saturday and deliveries to out-of-area postcodes may take a little longer (we’ll make it clear at checkout). To get free delivery, you have to spend £100 of your own money i.e. voucher spend is excluded. If you’re lucky enough to have a voucher in your account, please note that a minimum spend may apply. We can ship packs of 6 bottles, or any order of 12 or more bottles. ^While stocks last. We can't find a Naked Wines account linked to your Facebook account based on your email address, please register a new account here or link your existing account after logging in. Something went wrong while logging you in, please try again. Tick this box to stay logged-in, so it's easier to rate, post, add to basket etc. Please note, you will still need to log-in to update account info and order, and we don't recommend using this feature on shared devices / computers. Sorry, we don't support your browser! We only support Internet Explorer from version 10. Right now we're fully subscribed and there's a waiting list to become an Angel. 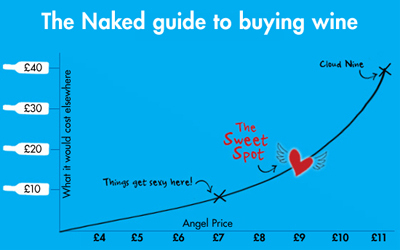 Our Angels support independent winemakers by investing £20 a month into their Naked Wines account, to spend whenever they want - in return for discounts, freebies, exclusive wines and more. By spending £8-£10 for a bottle of wine, you're actually getting more than DOUBLE the quality of wine than a £6-£7 bottle …pretty impressive huh? As the price of a bottle increases, more of your money goes towards the delicious juice in the bottle rather than tax, duty and other boring stuff that adds nothing to the taste. These Sweet Spot wines have benefited from the very best fruit picked from immaculate vineyards, oodles of TLC, and a lil' extra Angel-funding at every step of the winemaking process. I guarantee our Sweet Spot wines will blow you away. If they don't, then I'll give you every single penny back. So you've really got nothing to lose. In common with most websites, nakedwines.com uses "cookies". To find out more about this, click here.